If you're gearing up for a big Cinco de Mayo celebrations, don't forget the decorations, the margaritas and especially don't forget the BEEF! 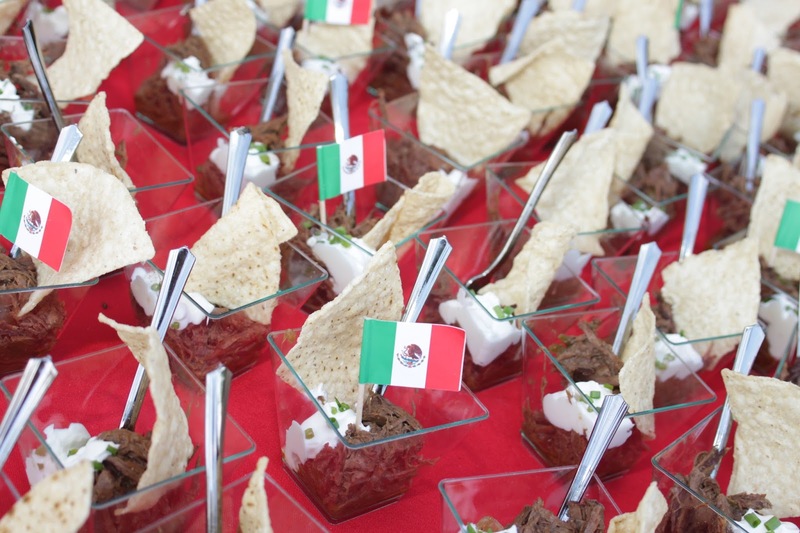 Get your Cinco on with some AUSSOME dinner recipes, using Aussie grass-fed beef! These easy tenderloin skewers are delicious with a tomatillo-based, salsa verde marinade (courtesy of A Merry Recipe), and the Top Sirloin shredded Machaca Nacho Cups are super simple in the crock pot. Don't forget the tacos! These strip-sirloin street tacos are slow-roasted in the oven with a brisket-style sauce, caramelized peppers and onions, and a DELICIOUS Mexican Street Corn Salad! 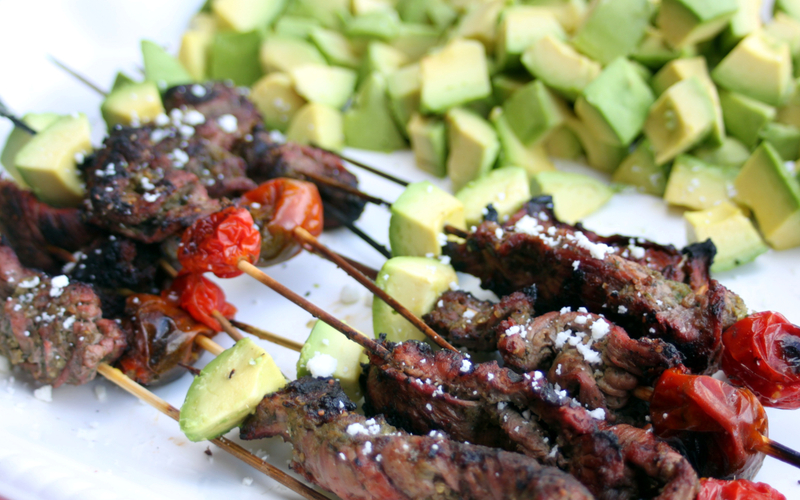 Place the skewers in a large pan of water to soak for about 2 hours so they don't burn on the grill. Cut the jalapeño and poblano peppers in half lengthwise and remove membrane and seeds. Place them open side down on a cookie sheet and broil for about 5 minutes, until skin begins to blacken and bubble. Turn over and broil for another 5 minutes. Remove from the heat, allow them to cool and peel the skin off of both peppers. Transfer to a food processor. Add the chopped tomatillos, scallions, cilantro, garlic, avocado oil, lime juice, salt and pepper. Pulse on high speed for about 30 seconds until the mixture is combined and makes a consistent, slightly chunky salsa verde marinade. Set aside. Slice the tenderloin into thin (1/4" thick) slices. Arrange the meat in a very large bowl or dish and cover it completely with the salsa verde marinade. Mix with your hands slightly if necessary to make sure that all the meat is covered in the marinade. Cover tightly with plastic wrap or foil and place in the refrigerator to marinate for at least 2 hours. Heat a large grill to medium-high heat (about 400 degrees). Remove the skewers from the water and place one slice of meat and a cherry tomato on each skewer. Cut the top sirloin into 6-8 large strips or pieces. Heat the olive oil in a large skillet on high heat. Place the meat into the hot skillet and brown the meat on all sides for 2-3 minutes. 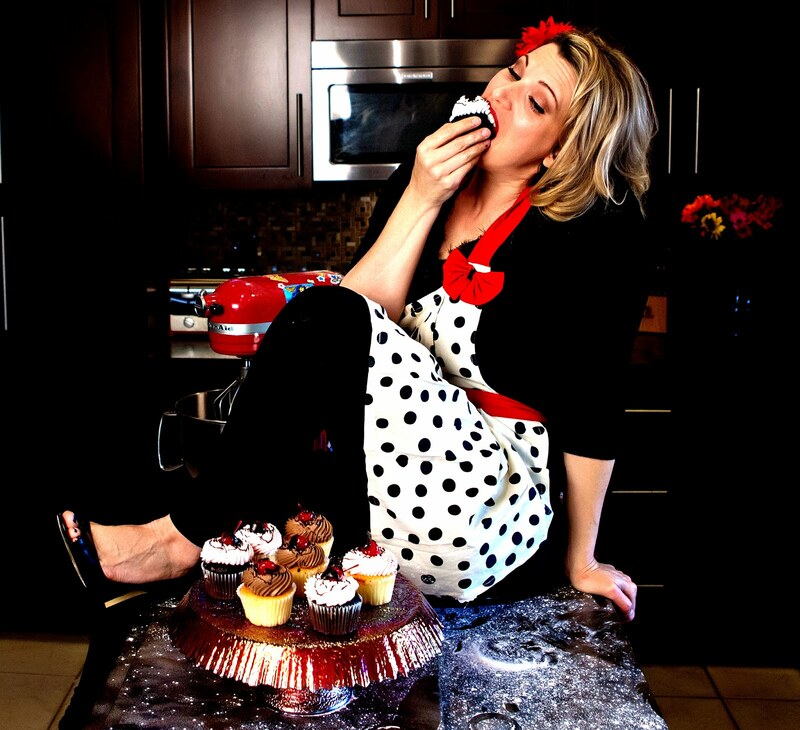 You may need to do this in batches. Transfer the pieces to a large crock pot once browned. Add about 1 cup of water to the skillet once the meat is browned and de-glaze the pan completely. Transfer the broth to the crock pot. Add the green pepper, onion, canned tomatoes, chili powder, paprika, garlic powder, cumin, salt and pepper to the crock pot. Stir until all ingredients are completely combined and covering the meat. Seal the crock pot and cook on high for 4 hours. 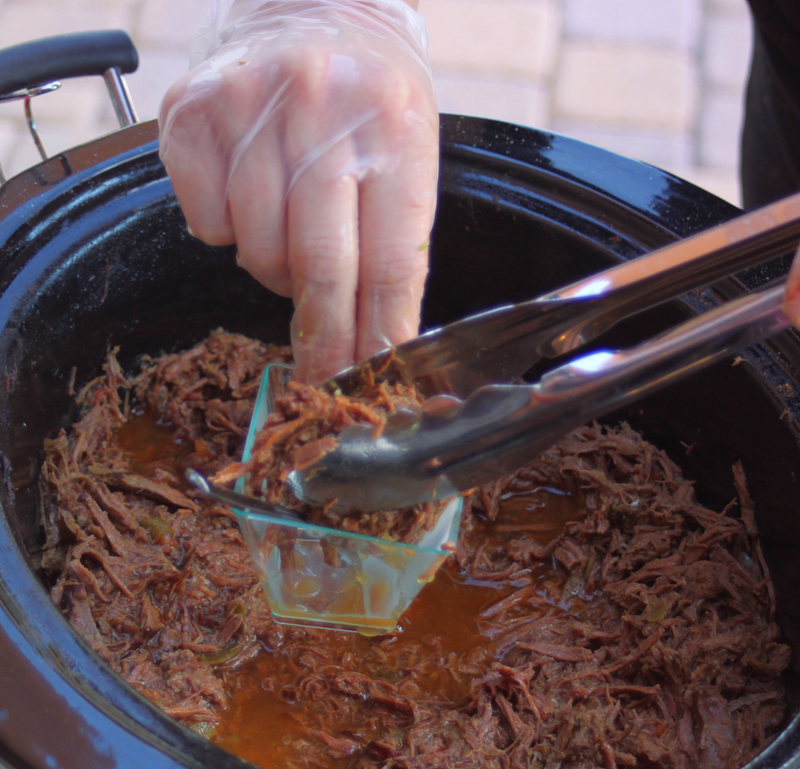 Remove the meat from the crock pot, one piece at a time and shred with a fork. Return the meat to the crock pot, re-season if necessary (I use half the quantity of the previous amounts added), and lower the heat on the crock pot to its lowest setting. Allow the meat to rest for about another hour at the lowest setting before serving. There should be plenty of liquid in the crock pot with the meat. To Serve: Spoon about 2 tbsp. of the shredded meat into small serving cups. Garnish with about 1 tbsp. sour cream, a pinch of chives and a tortilla chip. Preheat oven to broil (highest setting). Place the strip sirloin in a large roasting pan, fat cap up. Use a sharp knife to make 10 slits in various places in the meat. Fill each slit with a peeled garlic clove. Place the meat in the oven and broil on high for 10 minutes. Remove from heat, turn over and broil for another 10 minutes on the other side. Remove from the oven again, and reduce the oven heat to 300 degrees. Add the beef broth to the roasting pan, cover the pan with foil and return to the oven to cook for 1 hour. Heat the oil in a large skillet. Add the onions and peppers and cook for about 20 minutes, stirring occasionally, until well caramelized. Set aside until ready to use. In a large mixing bowl, combine the ketchup, chili sauce, turbinado sugar, onion powder, garlic powder, steak seasoning, salt and pepper. Stir with a whisk to combine and set aside. After 1 hour of cooking, remove the meat from the oven. Turn the meat over again so the fat cap is up and cover completely with the ketchup mixture, allowing any extra sauce to drip over into the juices on the side. Cover the sauce with the peppers and onions. Cover the pan with foil again, return to the oven and cook for one more hour. Remove the meat from the oven. 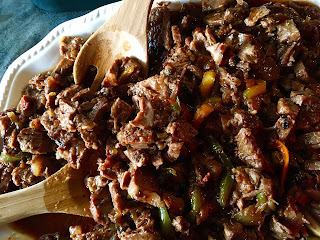 Cut the meat, peppers and onions together into bite size pieces with a sharp knife and return all the meat and veggies to the juices in the pan. Remove any large fat pieces if desired. Stir well to combine and serve with tortillas, Mexican Street Corn Salsa (recipe below) and some queso fresco! Grill or broil the corn and red bell pepper on high heat for about 3 minutes per side. Remove from the heat, allow to cool and remove the husks. Remove the kernels by placing the ear upright in a large bowl and run a sharp knife down the side of the ear. If you're working with frozen corn, heat 2 tbsp. of olive oil on high heat and add the corn. Allow it to blacken for about 2 minutes on each side, remove from the heat and transfer to a large mixing bowl. Add the chopped red onion, crumbled queso fresco, chopped cilantro, lime juice and chopped jalapeño (optional). Drizzle in the dressing, toss combine and serve.